Siddharth Desai continued his superb form as he collected 19 raid points for U Mumba. 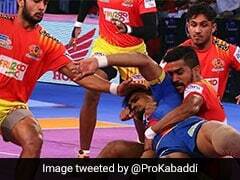 Siddharth Desai maintained his superb form as he collected 19 raid points and guided U Mumba to a fantastic 41-34 victory over Dabang Delhi in a zone A contest of the Pro Kabaddi League (PKL) clash on Saturday. U Mumba trailed by nine points in the first half but produced a solid performance in the second half. Hosts Dabang Delhi led U Mumba for most of the match but their defence failed to contain Desai in the second half. Naveen Kumar scored 12 points for Delhi but just like his team he had a quiet second half. Delhi's raiders got into the act early to give their team a 4-1 lead after four minutes. Vinod Kumar got a two-point raid as U Mumba reduced the deficit. Naveen and Chandran Ranjit put in successful raids as Dabang Delhi looked the better team and inflicted an all out in the 7th minute to lead 10-5.